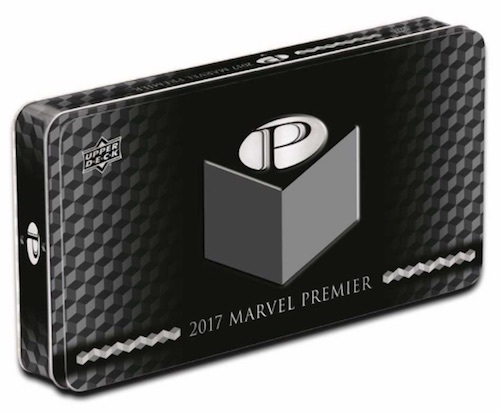 Returning to the quality brand last seen in the 2014 release, 2017 Upper Deck Marvel Premier picks up the high-end mantle once again with a one-pack box format. Each box includes two sketch cards. Those familiar with the line likely know that while many of the UD Marvel sets aren't cheap, Premier skews even further up the premium scale. Showcasing original art, the 55-card base set is numbered to 125 copies. Even more rare are the parallels, which include Blue (#/50), Gold (#/10), and Black (#/5). 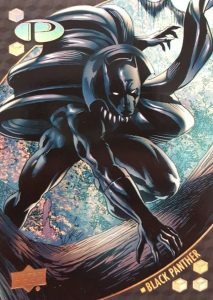 Base and base parallels combine to fall two per 2017 Upper Deck Marvel Premier box. Premium inserts are another part of the expected yield with one per box. 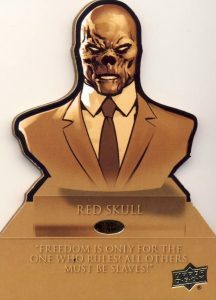 The Die-Cut Bronze Busts (1:2) come in every other box, while very limited LTFX parallels, numbered to just 15 copies, expand the options. 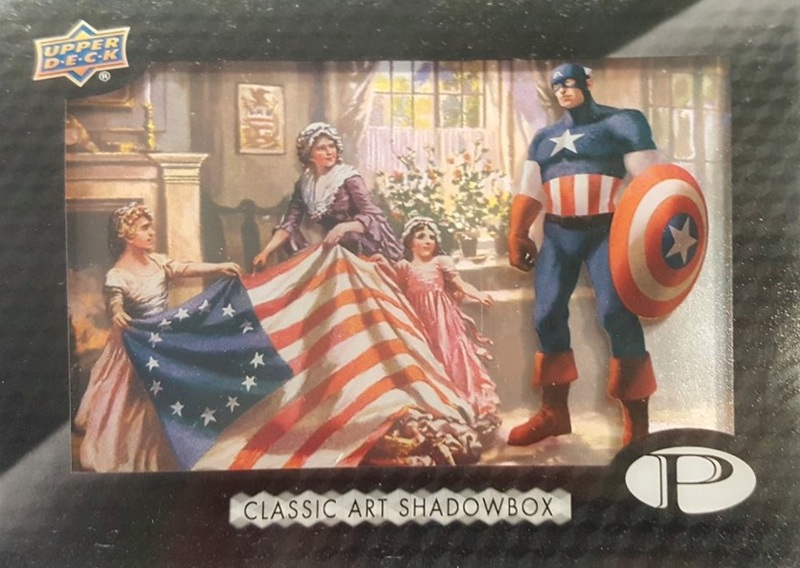 There are also the Classic Art Shadowbox (1:3) cards that combine Marvel heroes with famous images from the art world. Adding a frame, Hellfire Club Portraits sketch cards are numbered to 30. 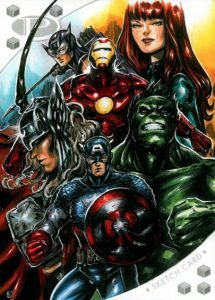 Sticking with tradition, the main hits in 2017 Upper Deck Marvel Premier are all Sketch cards. However, there is still variety to be found as they are issued in multiple forms. One Single-Panel version comes in every box along with a second sketch from the multi-panel or jumbo category. 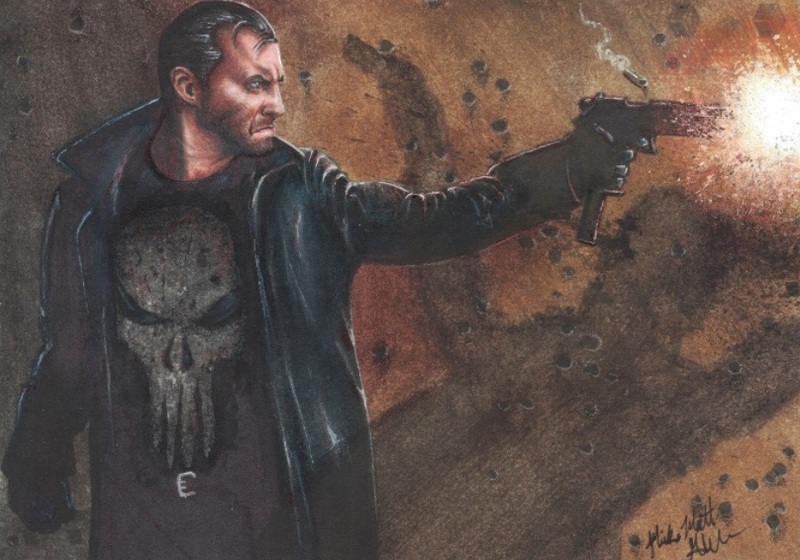 These include Dual-Panel, Triple-Panel, and Quad-Panel Sketches, as well as the new 5x7 Sketch cards. 55 cards. Serial numbered #/125. Shop base cards on eBay. PARALLEL CARDS: Blue Foil #/50, Gold Foil #/10, Black Foil #/5. 25 cards. 1:2 packs. Shop on eBay. PARALLEL CARDS: Gold LTFX #/15. 25 cards. 1:3 packs. Shop on eBay. CA-1 Iron Man "The Anatomy Lesson of Dr. Nicolaes Tulp"
CA-2 Green Goblin "The Maharashtrian Lady"
CA-3 Thor "Wanderer Above a Sea of Fog"
CA-4 Vision "The Vitruvian Man"
CA-5 Star-Lord "Napoleon Crossing the Alps"
CA-6 Black Panther "Tournee du Chat Noir"
CA-8 Kitty Pryde "Lady with an Ermine"
CA-10 Captain Marvel "We Can Do It!" CA-12 Wolverine "Portrait of Dr. Gachet"
CA-13 Scarlet Witch "Mrs. Cazelet and Children"
CA-14 Luke Cage "The Kiss"
CA-15 Iceman "Night Snow at Kambara"
CA-16 Ghost Rider "Abbey Among Oak Trees"
CA-17 Storm "Ship in the Stormy Sea"
CA-18 Ant-Man "The Basket of Apples"
CA-19 Dazzler "The Guitar Player"
CA-20 Mystique "Composition with large red plane/yellow/ blue"
CA-22 Thanos "Saturn Devouring His Son"
CA-23 Cyclops "The Desperate Man"
CA-24 Captain America "The Birth of Old Glory"
CA-25 Black Cat "The Last Spoonful"
15 cards. Serial numbered #/30. Shop on eBay. 143 artists. 1 single-panel sketch per tin. 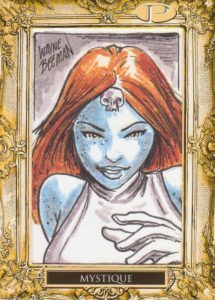 Shop sketch cards on eBay. 66 artists. Shop sketch cards on eBay. One Dual, Triple, Quad Panel or 5x7 Sketch per Tin. 64 artists. Shop sketch cards on eBay. 39 artists. Shop sketch cards on eBay. 36 artists. 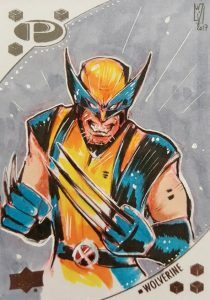 Shop sketch cards on eBay.